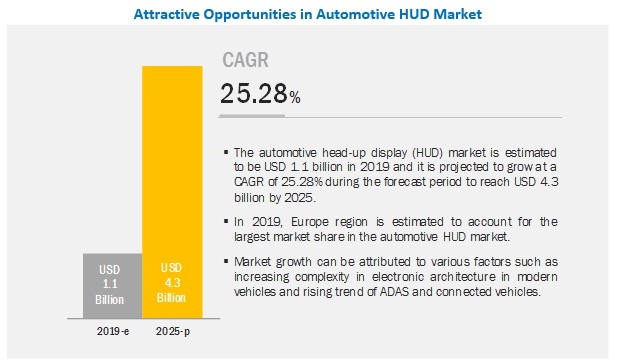 [161 Pages Report] The automotive HUD market is estimated to be USD 1.1 billion in 2019 and is projected to reach USD 4.3 billion by 2025, at a CAGR of 25.28% from 2019 to 2025. The key drivers of the market are increased adoption rate of advanced technologies by OEMs, fast generation of real-time and reliable data from advanced driver assistance systems, and growing connected vehicles. 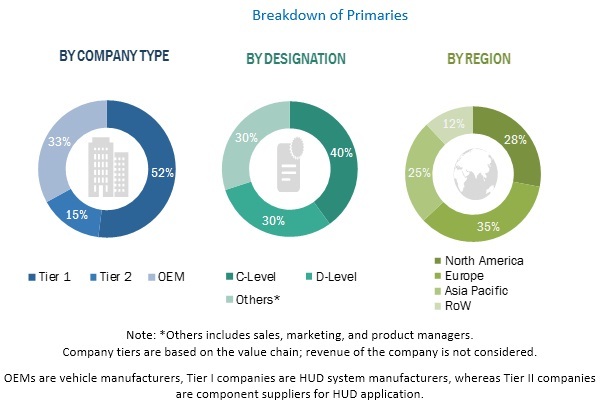 The conventional HUD segment is estimated to hold the largest market size of the automotive HUD market during the forecast period. The conventional HUD is estimated to broadly migrate to a wider range of mid-segment and economy segment vehicles during 2020–2025 because of the increasing adoption of the technology by OEMs, reducing installation prices of the HUD system, and, most importantly, the increasing importance of vehicle and passenger safety systems amongst the automotive customers. The windshield HUD type segment is estimated to record the largest market size, growing at a significant CAGR mentioned in the report. The windshield HUD system uses a projector and a set of mirrors to relay information, which appears either just below or above the driver’s line of sight. The system is developed to be adaptable to the curvature of the windshield. Different vehicle models have different windshield curvature, which makes it very essential to align the system to the windshield. The complex calibration process is required that increases the cost of the system, and thus it is largely offered as an optional feature in vehicles. However, OEMs are anticipated to integrate a wide array of advanced driver assistance systems in the windshield HUD and overlay the information in the driving situation with augmented reality. Unlike the combiner HUD, which is a compact display, the windshield HUD provides a larger area for visuals, and OEMs prefer the windshield HUD as it makes for a safer driving experience. Europe is estimated to account for the largest market size during the forecast period. 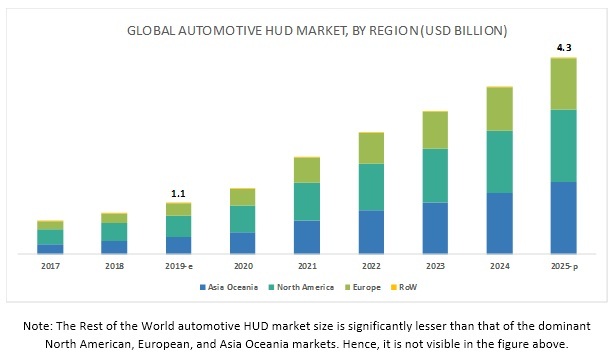 Europe is estimated to be the largest market with the highest share of the global automotive HUD market, by value. The regional market is dominated by the demand from Germany and the UK. The adoption of HUDs in the Russian market until 2020 is estimated to be low but is projected to increase in the future. The major growth drivers of the automotive market in the region include growing demand for technology, rising need for safe and secure driving experience, and increasing development of connected cars. The market is dominated by a few global players and comprises several regional players. Some of the key manufacturers operating in the market are Nippon Seiki (Japan), Continental (Germany), Denso (Japan), and Visteon (US). These companies have strong distribution networks at a global level. In addition, these companies offer an extensive range of products in the aftermarket. The key strategies adopted by these companies to sustain their market position are new product developments, merger & acquisitions, and expansions. In October 2018, Continental revealed an industry-first full-color demonstrator of an automotive-specific HUD based on the waveguide technology. This demonstrator is the result of the joint development with DigiLens. The Continental AR-HUD with waveguide technology significantly reduces the packaging size. With this new, innovative technology, Continental achieves an augmentation area of 15° x 5° (= 2.60 x 0.87 m at a projection distance of 10 m) while bringing down the device size to a mere 10 l magnitude. Continental’s demonstrator enables augmentations within a field of 2.60 x 0.87 m at a projection distance of 10 m and solves the previous size issue of the AR-HUD. In January 2016, Panasonic Automotive developed an Automotive AR-HUD that projects virtual images in the driver’s field of view. It projects virtual images of the road and driver information on the HUD. In June 2016, Denso acquired a stake in NTT DATA MSE Corporation, an automotive platform software developer, to strengthen its software development capabilities for automotive meter and display control. In January 2017, Visteon demonstrated an AR-HUD at the CES, in the US. The new interface is likely to provide driver information on the HUD, project virtual images of the street, and street obstructions on the windshield for the driver. In September 2018, Nippon Seiki started full-scale development of compact HUDs for low-end vehicles including vehicles with engine displacements below 660 cc. The company has a track record of producing HUDs for European high-end vehicle models. It is hastening the commercialization of compact HUDs to start mass production by around 2021 or 2022. It aims to more than double the HUD sales to reach JPY 50 billion as early as possible. How will vehicle sales trends impact the market in the long term? How will the industry cope with the challenge of the high cost of HUDs? How do you see the impact of government regulations in the market? What are the upcoming trends in the market? What impact would they make post 2020? What are the key strategies adopted by top players to increase their revenue? The study involved 4 major activities in estimating the current market size of the automotive HUD market. Exhaustive secondary research was done to collect information on the market, the peer market, and the parent market. The next step was to validate these findings, assumptions, and sizing with the industry experts across value chains through primary research. Both top-down and bottom-up approaches were employed to estimate the complete market size. Thereafter, market breakdown and data triangulation were used to estimate the market size of the segments and subsegments. The study involves country-level OEM and model-wise analysis of automotive HUDs. This analysis involves historical trends as well as existing penetrations by country as well as by vehicle type. The analysis is projected based on various factors such as growth trends in vehicle production and regulations or mandates on the implementation of automotive electronics, which drive the market. In the secondary research process, various secondary sources such as company annual reports/presentations, press releases, industry association publications [for example, automobile OEMs, Canadian Automobile Association (CAA), country-level automotive associations and trade organizations, and the Department of Transportation (DOT)], automotive magazine articles, directories, technical handbooks, World Economic Outlook, trade websites, technical articles, and databases (for example, Marklines and Factiva) have been used to identify and collect information useful for an extensive commercial study of the global automotive HUD market. Extensive primary research has been conducted after acquiring an understanding of the market scenario through secondary research. Several primary interviews have been conducted with market experts from the demand- and supply-side OEMs (in terms of component supply, country-level government associations, and trade associations) and component manufacturers across 4 major regions, namely, North America, Europe, Asia Oceania, and rest of the World. Approximately 40% and 60% of primary interviews have been conducted from the demand- and supply-side, respectively. Primary data has been collected through questionnaires, emails, and telephonic interviews. In the canvassing of primaries, we have strived to cover various departments within organizations, such as sales, operations, and administration, to provide a holistic viewpoint in our report. The figure given below illustrates the break-up of the profile of industry experts who participated in the primary discussions. After arriving at the overall market size-using the market size estimation processes as explained above—the market was split into several segments and sub-segments. To complete the overall market engineering process and arrive at the exact statistics of each market segment and subsegment, the data triangulation and market breakdown procedures were employed, wherever applicable. The data was triangulated by studying various factors and trends from both, the demand- and supply-sides. This research report categorizes the automotive HUD based on type, technology, vehicle class, dimension type, vehicle type, and region.